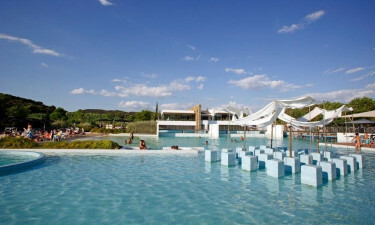 Situated right on the Tuscan coast, Santapomata is a destination where relaxation and entertainment meet. Guests are treated to private access to a stunning sandy beach as well as free use of a wide range of first-rate facilities. 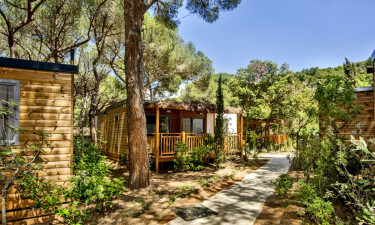 By booking your stay through LuxCamp, you know that you are going to be in good hands during your luxury camping holiday. 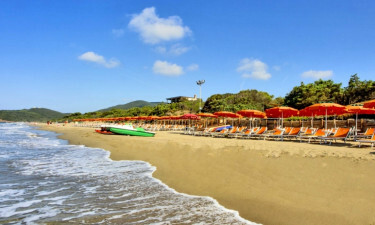 The enchanting Tuscan coast is just waiting to be explored by people who choose Santapomata for their camping holiday. An ancient castle can be found at the top of the rocky coastline at the edge of the site, while a large number of sports can be enjoyed on the site, such as tennis and football. The site boasts its own pool where guests can splash around. Refreshments are available at the nearby snack bar so that guests never need to wander far. 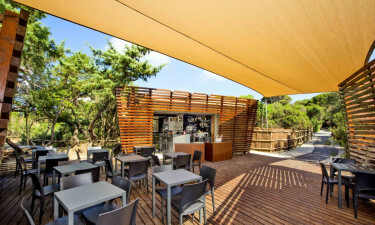 Guests will find that it takes just a couple of minutes to walk from their mobile home to the stretch of golden sand that lines Santapomata and this is an excellent place to unwind in style. A large number of sun loungers are set on the sand for guests, while the crystal-clear water that laps the shore is waiting to be enjoyed.